1. Place the 8% brine in a bowl big enough to contain the chicken thighs. Add the chicken to the brine and leave covered with clingfilm in the bowl in the fridge for 5 hours. Then remove the chicken and discard the brine. Rinse the chicken under cold running water for 5 minutes, pat dry with kitchen towel. Using 8 skewers, alternate chicken thigh cubes with the pepper and lemon pieces. Place on a tray, cover with clingfilm and place in the fridge until needed. 2. While the chicken is in the brine, mix the cornflour with 10ml (2 tsp) of water until well combined. Place the sugar, 80g of chicken stock,the lemon zest and juice, rice wine vinegar, salt, garlic in a pan over medium-high heat and allow to come to boil. Add the cornflour mixture, allow to boil for 30 seconds or until it thickens. 3. To cook the quinoa, mix 500ml water with the remaining chicken stock and bring to a simmer. Add the quinoa and cook over a low heat until tender, drain using a fine sieve and spread evenly onto a tray lined with parchment paper to allow to cool completely. 4. Place the eggs in pan and cover with cold water, place the pan over medium-high heat and once it comes to a boil, cook for 12 minutes. Remove the eggs from the water and place in an iced water bath to cool completely. Once cold, peel the eggs, remove the white and chop into small cubes. Pass the yolk through a fine sieve. Reserve both. 5. To finish the salad, mix the cooked quinoa, cooked and chopped egg whites, cooked and passed egg yolks, chopped parsley, remaining lemon zest and juice and tomato, until well combined. Season with salt, freshly ground black pepper. 6. Brush the kebabs with the sauce and place on a barbecue or grill for 20 minutes until cooked throughout (with no pink meat), basting with the sauce. 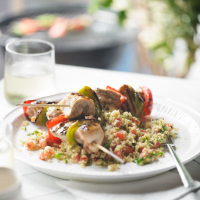 Serve the chicken kebabs with the quinoa salad.